Artichokes are the flower head of a variety of large thistle. For most, cooking this unusual vegetable for the first time can be a challenge. Here we show you how easy they are to prepare. Artichokes can be used as an ingredient for another dish, or served as a starter with a simple dressing or hollandaise sauce. They have a distinctive, nutty flavour. Each leaf should be eaten separately - pull it through your teeth to enjoy the tasty pulp, then discard. The spiky choke at the centre should be removed to reveal the prized, meaty heart at the base. Using a sharp knife, cut the top third to a half off the artichoke to expose the heart. Cut the stalk off and pull away and discard the tough, woody outer leaves. Trim and neaten any ragged leaves with scissors, keeping their characteristic shape. Rinse thoroughly, pulling leaves apart to ensure no grit is lodged between them. Slice a lemon in half. Rub the cut surfaces of the artichokes with the lemon pieces to prevent them from turning brown. Bring a pan of water to the boil. Place a steamer basket or colander on top and arrange the artichokes inside, with their stalk ends facing up. Cook for about 30-40 minutes. To test if an artichoke is cooked, hold it in a clean tea towel and pull at a leaf and, if ready, it should come away fairly easily. When cooked, remove the artichokes from the steamer. If they are to be served cold, plunge into cold water to stop them from cooking any further. Using your fingers or a teaspoon, remove the central cone of leaves. The choke is inside the central cone. It is inedible and should be discarded. Use a teaspoon to scoop it out. The best way to serve warm artichokes is to spoon hollandaise sauce into the hollowed out centre. Alternatively, try flavoured oils such as basil, tarragon and thyme, or lemon or orange juice. To eat, pull off each leaf, dip it in the sauce and draw it between your teeth to remove the flesh. Then use a spoon to scoop out the flesh from the heart. Provide plenty of napkins and finger bowls to keep hands clean. 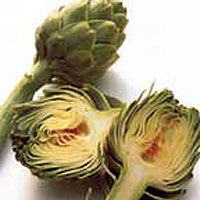 If the artichokes are to be served cold, cook them, then plunge into cold water to stop them from cooking any further. Drain thoroughly. Serve with Waitrose Organic Extra Virgin Olive Oil and Lemon Fresh Dressing. When selecting a fresh artichoke, pick one with fleshy, smooth green leaves that feels heavy for its size. If it is not going to be used immediately, moisten the top of the artichoke with water then place in a plastic bag in the fridge. Keep for up to 2 weeks. To prevent the artichoke from discolouring during preparation, rub cut surfaces with half a lemon. Artichokes will retain their pale colour during cooking if boiled in water with added lemon juice - use 4 tbsp lemon juice to 1 litre of water. Artichokes can be grilled - cut them in half, remove the choke, rub with olive oil and garlic and barbecue or grill for about 30 minutes, turning once. When cooked, the base should be tender when a knife is inserted into it. To roast artichokes, trim them as for grilling, above, then cut into 6 wedges. Dip them into a bowl of water with lemon juice, then drain and pat dry on kitchen paper. Toss them in olive oil to coat, then place in an ovenproof dish with some fresh thyme and 3-4 tbsp dry white wine. Cover with greaseproof paper and then foil (so the artichokes do not come into contact with the foil as this will cause discolouration), and bake at 200°C, gas mark 6, for 35 minutes. Remove the foil and paper and cook for a further 20 minutes, until the edges begin to brown and crisp. This recipe was first published in August 2002.